”I think that this is an interesting time. I think that people are interested once more in formulating a different society I think people are kind of bored of being exploited they’re bored of a cultural narrative that supports elitism and it exploits the people. The planet is being destroyed, we are creating an underclass we are exploiting poor people all over the world and the genuine legitimate problems of the people are not being addressed. I suppose what’s happened is this is what I believe in mate, is that certain cultural narratives are promoted that are beneficial only to elites. These cultural narratives are not true. I think of contemporary bi-partisan politics is a meaningless spectacle designed to distract you from where power truthfully dwells. Politics just needs to be the administration of certain spiritual principles. For me the spiritual principles that are important is that we are all one we’re all together and every individual’s rights need to be respected. I think that we need to see politics is the implementation of spiritual principles of oneness, togetherness, tolerance of one another and making sure the people are taken care of. This is what I think I think we need a spiritual revolution more than a political one. I believe profoundly in the power of humanity. I believe that we are connected. I think there’s an inevitability to a successful revolution. I think this is a change in consciousness they we are experiencing. I feel that we will survive. There’s going to be radical changes. I think we need to be looking at the world as… pretty worried about the new world order thing. But I think we need to look at the world as one inclusive entity we need to look at how many people there are on the planet. We need to look at the resources that are available on what’s the most sensible thing to do with that. I think there’s going to be massive change for the power structures that currently exist. You cannot define yourself in reference to other external co-ordinates. You must define yourself internally with your relationship with a higher entity. Think of yourself as a manifestation of some higher thing – some higher frequency. This is the visible realization and you know that because you can’t see atoms can you? And you certainly can’t see the forces that hold the atoms together. There in the micro-quantum world lie the answers to everything. You can’t understand it with our logical rational minds but we feel it intuitively. Get yourself in line with that stuff and you beam like the sun. I suppose the ultimate truth is oneness that this is a temporary illusion that we all temporarily occupy these flesh puppets. We believe so much in our own identities. We believe in our individualism. I talk as an egotistical man. Look at my hair; look at these bracelets; look at these ridiculous boots. I’m a person that believes in the nature of my own individualism and my own identity. On a deeper level I recognize that all these things are transient and what’s important and what’s defining are the things that we all share: love, unity, togetherness. As long as we have cultural narratives that eschew these ideas, that suppress these ideas in favor of negative human traits: greed, selfishness, lust. As long as these ideas are promoted, we will really exist in opposition to one another. And we will be exploitable by corporations that prey on these negative facets of humanity. There’s going to be a revolution. It’s totally going to happen. I don’t have a flicker of doubt. This is the end; this is time to wake up. Like it says in the Lord’s Prayer: on Earth as it is in heaven. There are subtler dimensions, subtler frequencies in which we are that realization. If we become in tune with a different narrative, a different story – if we lived as god would have us live – then the world would change automatically. It would just happen automatically. ‹ What happens when you die? Russell is such a visionary, it’s time he was taken more seriously. he sure is, his knowledge of advanced concepts such as quantum physics and the interconnectivity of all life is pretty profound – and explained so eloquently too! 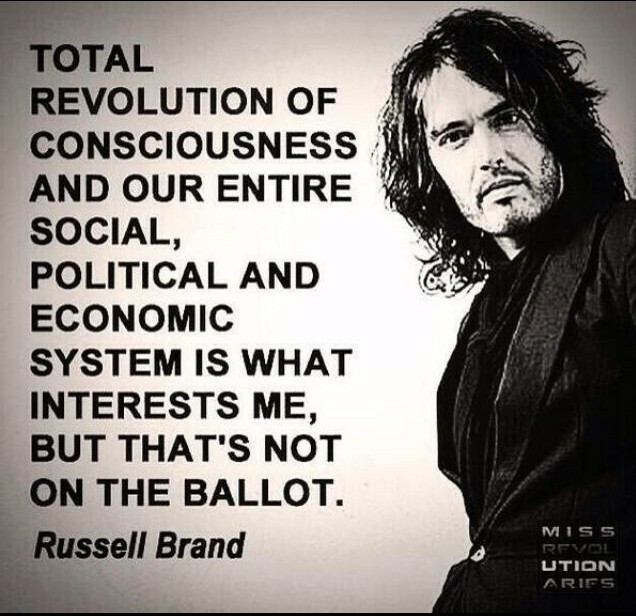 I hope more people take notice of him too but the mainstream press will always to mock him as they a) don’t understand his wisdom, and b) they are part of the very system Russell speaks against!! 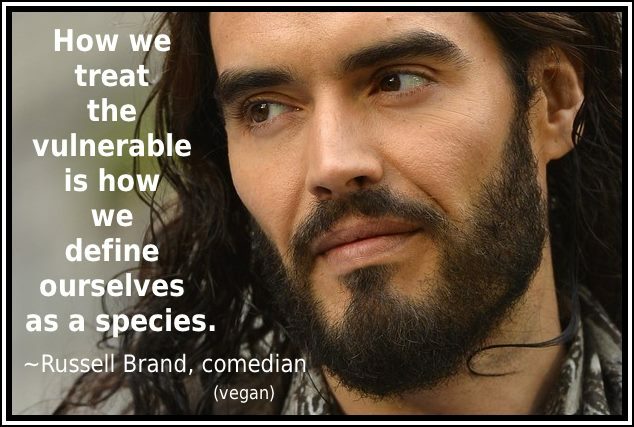 I loved his quote about the way we treat the vulnerable defining us as a species. Me too. I think we’ll look back in astonishment in say 100 years time at the way our society treats the vulnerable, animals included. I hope change will happen far sooner than that though! I'm Emma; Just meandering through life on the road less travelled. Treading lightly on this beautiful planet, sewing seeds of inspiration, hope and grace.